If your boss slashes your pay, if you have no savings because you spent more than you earned for many years, and if your creditors are threatening to cut off your credit cards and home equity loan, what happens? The answer, of course, is that you're in serious trouble. And this could be the situation for the U.S. government -- which is facing lower income tax receipts and ballooning deficits -- if China loses its appetite for extending more and more loans by buying U.S. Treasury securities. But in Beijing on Friday, Premier Wen Jiabao told reporters that he was worried about the U.S. becoming something of a, well, deadbeat. "We have made a huge amount of loans to the United States. Of course we are concerned about the safety of our assets. To be honest, I'm a little bit worried," Wen said. "I would like to call on the United States to honor its words, stay a credible nation and ensure the safety of Chinese assets." For its part, the White House tried to reassure its Chinese creditors. Spokesman Robert Gibbs said Friday afternoon: "There's no safer investment in the world than in the United States." It's unlikely that China would dump its Treasurys; for one thing, substantial sales would depress prices of the rest of its portfolio. The Wall Street Journal suggests that the gold market isn't large enough to represent a viable option, and "it's not clear, meanwhile, that euro, or yen-denominated debt is any safer, more liquid, or profitable than U.S. debt -- key criteria for China's leadership." But China could reduce or halt future purchases. A less ravenous appetite for Treasurys is already evident: a New York Times article in January was titled: "China Losing Taste for Debt From U.S." One reason for fewer purchases would be diversification. 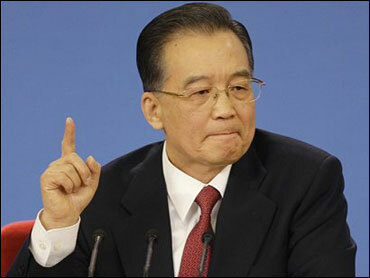 Another would be to divert money toward its own 4 trillion yuan ($586 billion) stimulus package. Reduced demand for Treasurys would drive up U.S. interest rates, probably pushing down home prices even more than they've already fallen, and also could start a run on the dollar. This is also why, at least in part, U.S. taxpayer dollars were used to bail out Fannie Mae and Freddie Mac last year. A Business Week article says that foreign bankers were worried, especially China, which owned around $376 billion of Fannie and Freddie debt. "Treasury saw foreign governments getting the willies," a Senate aide told the magazine. Which makes the recent flap between a U.S. Navy surveillance ship and three Chinese ships (including two fishing vessels) in the South China Sea more inexplicable than usual. Given their intertwined economies, both countries need each other more than usual right now.